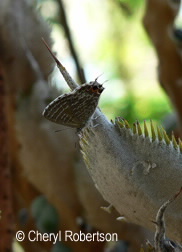 The larvae which feed only on native and introduced cycads may be attended by ants from seven genera. Mature larvae are usually variously green, some bands of different colours may be present, humped: head brown. 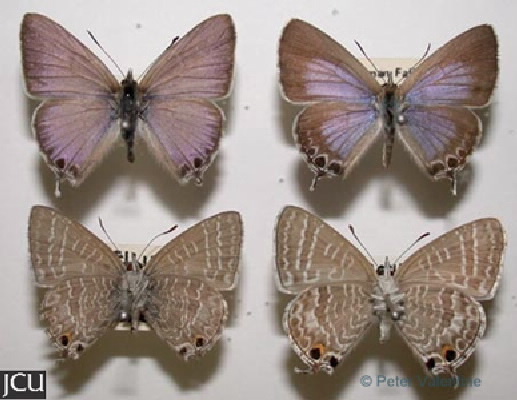 Adult male dull lilac or greyish-lilac, narrow brown outer margin, hind wing with brown-black spots, the largest near the slender tail; female brown with lilac central area; lower surface grey-brown or brown with a series of darker brown spots ad bands edged with white, two black spots edged with orange near the tail.